Do you remember your first art-related memory? It might not be my first interaction with art, but I remember sitting down with my best friend at the time, sketching and talking about what we wanted to be when we grew up. I wanted to be an artist and she said she did as well and we had this huge argument about who was copying who (laughs) I was in kindergarten! Probably around 5 or 6 years old and we were having this huge fight. Funny thing is she’s an artist now as well, living in Korea. 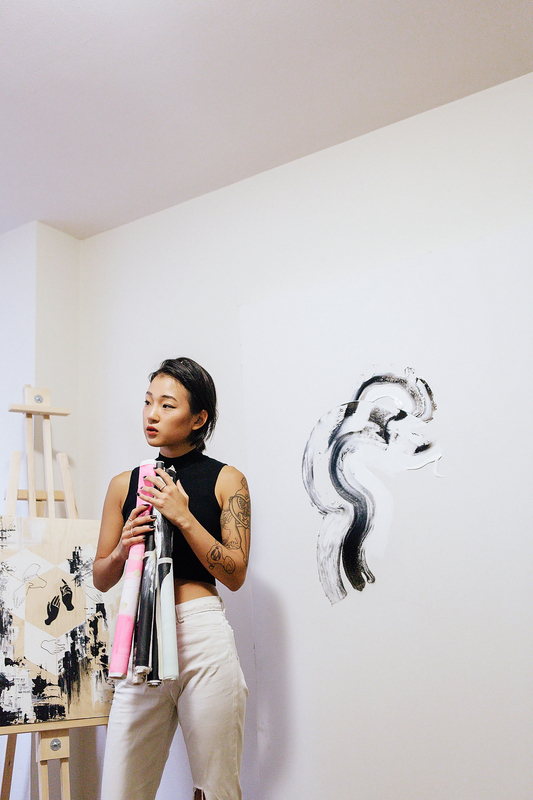 Has having grown up in Korea influenced your art in a major way? I was born in Seoul and came to Toronto when I was in Grade 5. I have two really good friends that still live there and I actually really wanted to learn from one of them this summer because she does beautiful traditional Korean paintings. I’ve gotten a lot of responses from Koreans or anyone that sees my work that’s educated in the background of East Asian art in which they see similarities to it in my work. I paint very subconsciously so it wasn’t my intention but it’s interesting to see the reflections, which is why I want to learn more. It’s important for me to know where I come from, and not only race and culture but my personal history. My memory of it, how I process it, how it comes out… I believe that when somebody is comfortable in their own visual language and they paint intuitively, they create their own archive of images and mark-making that just comes through. It must be interesting to discover such strong similarities when your artistic intention perhaps has nothing to do with them. What do you see when you see your work? I did study a lot of art history so I can visually connect the styles, but I still don’t see that perspective strongly. When I see my work, even though people have given me scattered responses, I still just see it as the state that I was in when I was painting it. I relate it more to my thought, my own concepts. What do you do when you reach a point when your brain isn’t in that creative state? I never force anything. I can go months without doing anything and I’m completely okay with it. I don’t care. What I believe is that in order to create artworks that are solid, you have to be a mature person. You mature as a person and your work grows with you. So I just take that time to experience more. As to integrate the information that surrounds you as to express it in a different form. Yes, because that’s how I believe the relationship between our memory and making work is. Truthfully, I don’t have any aspect of my life that is not related to art… everyone that I’m incredibly close with are creative beings, mostly visual artists. If I’m going to a social setting, it’s almost always gallery shows and so my conversations are mostly centered around that. I don’t stress too much about what’s next. You briefly studied Psychology and Art History before moving to Drawing & Painting.. How have these subjects affected your thought process? I’ve always loved psychology, both my parents are psychologists and I still incorporate so many elements of it. It’s what I’ve had to cope with since I have recollection of being an individual. I was very psychologically unstable and art was what I used to kind of process myself. It’s very important to me. As for art history, I like knowing where my piece stands in the framework of art history, I like knowing what relationships it can have with it but it’s not very important to me because what I’m mostly working now with is the digital medium, which you can’t really find any academic studies on because it’s so new. We’re still at the baby stages and have no idea in which direction it can take us. There’s so much to explore and so much room to actually develop your own thoughts on what it means to be using it philosophically. You mention at one point the digitalization of identity, which is mostly responsible for shifting these perceptions. I think that people fail to understand that, yes, even if we’re so intertwined with everything digital and have our own digital identities on social media and all that… it’s not real. Those images and programs and articles exist completely outside of the spatio-temporality of this world. A computer is like a human brain and any digital files within it are like ideas to the brain. Both are abstract, digital presentations of your concepts, records of nothing. A concept in my head is nothing until I produce it and I solidify it… That’s how the digital relates to the human psyche. It’s interesting to see the massive influence the digital world has on humans, even being simply records. It’s ridiculous how much influence it has… Because it’s not limited to a single space in time, that same thing can have a relationship with thousands of people at the same time. Even if I say these files are not real, I’m not doubting the fact that the emotive qualities, the response, the experience that people have with it aren’t. It’s difficult to separate the two. Your work explores that middle ground between the analogue and digital. Can you speak to that? I think people around our age are still capable of learning all the new digital technologies and use them comfortably even if we have a very analogue past, different to those who are a bit younger than us. They were born into a digital landscape and never saw understood that separation. Our generation knows that analogue and digital is separate because we’ve experienced it. I personally like to be more in tune with physical reality. I’m that person that believes in stardust, in everything coming from one atom. What fascinates me about digital medium is that you can both expand it and go into it infinitely. We are the first generation capable of taking an atom, turning it into a bit - a painted pixel - and then back into an atom. We can do that so freely and I feel it’s so important to show that process in my work because that’s how we live. That’s how our human existence is: atoms to bits to atoms… To the point where you can’t really distinguish what process it went through. How do you think the digital perspective of those born later than 2000 will influence their work within the arts? I think the reason people reject or distance themselves from digital medium is because of the academic world. You can’t really put a price on a .PSD file. There’s no real value because it’s not a real thing, which turns people off. I don’t know if that art market is going to change in the next ten years - which is when these people will be practicing - but I think it’ll be very much dictated by the academic world at the time. I feel like the virtual world will just have to override our everyday experience completely for there to be a platform in which it gains have value for the first time. I honestly can’t say what these people are going to be creating because we have absolutely no idea what kind of technology is going to come out in the next hour, you know? The growth of technology has been so exponential and you continue to see an increase in the blending and immersing of ourselves in this cyber space. I don’t know how human existence is going to change in the next five years, along with the technology and tools that can be used to create art. Maybe people won’t make in 2D anymore, or maybe they’ll push the 2D further and bring it back to make a commentary about how digital medium is. It’s interesting to look at yourself in relation to the context you’re in. Since any form of image making existed, people wanted to create an visual space in which they felt they were immersed in. Like Renaissance paintings, they’re created to make it seem like you’re in the painting. It’s important to limit yourself though, when you’re using digital technology. There’s so much that you can do, even in one simple program there are endless tools and if you get lost exploring you won’t be able to find your own style. Whether it’s paint or printmaking or digital, I always like to limit myself to a couple of tools, in that way you can develop a digital language and use that tool and not make your work about technology. You’re using technology, but it’s not using you. Through technological manipulation you're able to renew images, recycle them. It’s beyond being able to stretch something physically, it’s about what it means conceptually to do that. A whole different language and experience is created through this new process. Through making my art and being in that environment, I was able to purge out all of the negativity in my life. I was able to get control over myself through my art and become more of a solid person. Finding my place in the world is what I got through art… I always knew so much and experienced so much but I could never make sense of it. It was all scattered and too confusing and art made me able to piece things together, process it, understand it, come to terms with it and actually become one person through it. I actually felt like I was a digital being before, I was everywhere, I was very detached as a person, felt displaced. I would not be alive without art. You see, I wanted to go to an art university but my parents were against it and at that moment, I didn’t know what you could do with art, so I considered it more of a hobby. So I went to UofT and got really depressed because I had lost that one thing that held me together. I had to work so hard and go through so much to gain back what I had lost. I went through a lot of abuse, but I would never change anything because that’s what has helped me create these works. I wouldn’t have grown without those negative experience.